Hadrian's Wall - The second most famous wall, after the Great Wall of China, in all antiquity. After Julius Caesar abandoned his campaign in Britain in 54 B.C., the Romans did not return for almost hundred years. But when they did, they began conquering it in 43 A.D., under Emperor Claudius. However, they were not able to conquer the entire island. They controlled everything up to roughly the present-day border between England and Scotland. The land to the north of their territory they called Caledonia. In order to prevent raids from the Celts living in Caledonia, they built a wall beginning in 122. The order came from Emperor Hadrian, and he was even present at the groundbreaking. Thus the wall, which was completed in 128, was named Hadrian's Wall. It runs east to west for 73 miles (118 km) from the River Tyne to Solway Firth. Built to protect Rome's northern border of Britannia, the wall was just the most visible (and imposing) part of a sophisticated defense system. and would be the empire's most heavily fortified border. It averages anywhere from 10 to 20 feet wide (3 to 6 m), and 11 to 20 feet high. To this day, some sections as high as 10 feet survive. A small fort, known as a milecastle was built at roughly every Roman mile interval (4860 ft or 1481 m). And in between each of those two defense turrets were built. So there were two turrets for every milecastle. In addition, on the Roman side of the wall, about 15 full-size forts, complete with quarters which could house anywhere from 500 to 1000 soldiers, were built across the length of the wall. Finally, a ditch on the south-side (Roman side), called the Vallum was dug from coast to coast as a last defense should an enemy somehow get past the wall. It was roughly 10 ft (3 m) deep and 20 ft (6 m) across. Also the Romans built roads, both from the south to the wall, and along the length of the wall to make travel quick and easy. Historians have questioned whether or not such a formidable defense was needed on this northern border and have speculated that it was built primarily as a show of power to any Celtic tribe that would dare challenge the Roman Empire. 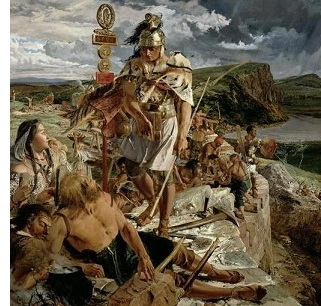 Not many know that a second barrier was built north of Hadrian's Wall about two decades later. Named Antonine's Wall because it was built by Hadrian's successor, Anontinius Pius, it was abandoned after only 20 years and not much of it survives today.